Just a quick look at a casual 40s-ish look from a while ago - mainly because I was pleased with the hair! I'm wearing my vintage human hair hair net from Joanna, which is always a bit tricky to put on as the top isn't elasticated, but it's worth it! I love this vintage preppy 40s collegiate look!!! So cute! I really like your cute and casual look! I don't know if I'm more in love with the sweater or your hair. I love the hairstyle! So cute! You look frightfully modern in jeans! Hah, is that a good thing or a bad thing?! They're modern jeans I'm afraid as I haven't been able to source any vintage ones, and I haven't got around to getting a pair of Freddies of Pinewood yet. Why not full 40s if you've done your hair? It *is* 40s style - Google "40s collegiate" and have a look at they styles worn by college girls of the day. It's not authentic 40s because I down own original 40s versions of the cardigan or jeans. Plus, with my current lifestyle, wearing head to toe original 40s clothing is often not at all practical. On the day I wore this outfit, I spent a while in a field looking for dung beetles for a scientific study which I am helping with. I definitely don't want mud or sheep poo on any of my original 40s clothing! Also, I sometimes like to mix and match with my oufits. I describe my style as "vintage" rather than as being from one particular decade. I don't like to feel too restrained with my clothing - life is too short. Super love this ensemble and must say that this charming casual style really looking fantastic on you, dear gal. 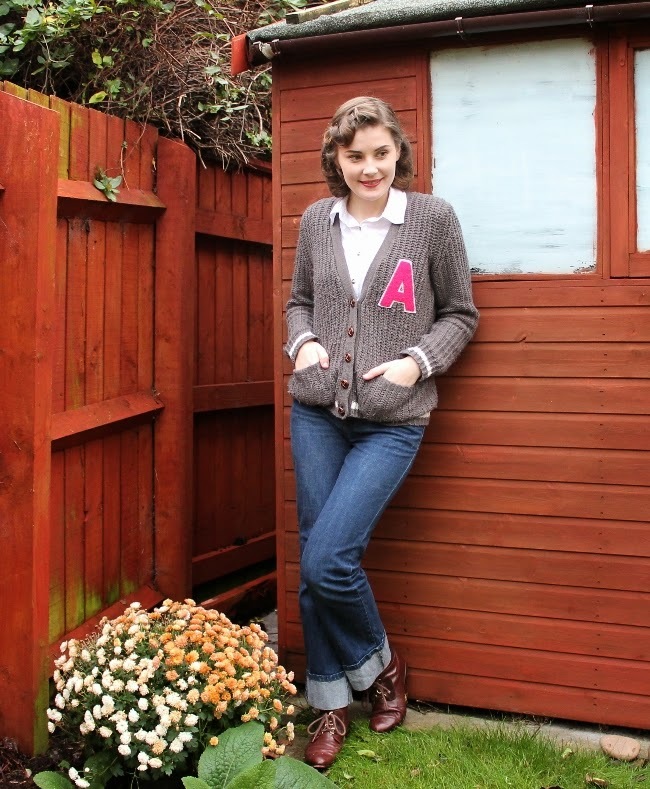 I've wanted a lettermen's sweater/cardigan of my own for ages now. One day! This is darling! What an adorable sweater!